I celebrated another birthday on Monday. Well, “celebrate” may not be the right word, as it was the most “meh” kind of birthday ever: As I’m still trying to succeed at my latest attempt to diet, I nixed all of my family’s suggestions for taking me to dinner or any other activity where I might have to stray from my current nitrate-free, non-soy, non-dairy regimen. You know this is serious. I haven’t had a cup of coffee since my bout in the hospital last month. For the most part, this hasn’t affected my ability to get up every school day morning at 5:30 AM… but after 40 years of caffeinated living, my brain feels fuzzy. And as much as I miss writing, I have not been able to muster enough focus to finish anything. At last, I join the 21st Century. Maybe it’s the caffeine. Or maybe it’s the fact that I got a new toy over the weekend………….. I used to be something of an early adopter. In fact, one of the reasons I signed up with T-mobile over 10 years ago was because I fell in love with the idea of owning a cameraphone, and they offered one that didn’t cost a small fortune. This device featured a small camera that attached to the bottom of the handset (the camera part was not yet integrated). It did not take wonderful pictures, but I loved it anyway. My husband and I considered switching when the first iPhone debuted exclusive to AT&T… but our entire family (including my sister’s brood and my parents) are on T-mobile and leaving would mean losing free calls to one another. So I waited. T-mobile uses the same GSM system as AT&T, so I figured that when their exclusive deal with Apple expired, we would be next. Obviously, that was a bad call. I watched as iPhone was rolled out to Verizon and Sprint and even pay-as-you-go Virgin Mobile, while I tracked every rumor of a deal between T-mobile and Apple. At one point last year, it looked like AT&T would buy T-mobile and I would have access to iPhone by merger. But that one fell through and so I continued to make do with a sputtering Blackberry that was now crashing on me several times a day. Even my husband was tired of my decrepit old cell phone: His Chrismukah gift to me was a new one, my choice. I came close to choosing a Samsung Galaxy. But then I tried to place a call with my husband’s Android and I realized I didn’t have the energy to learn another new operating system. I decided to wait. 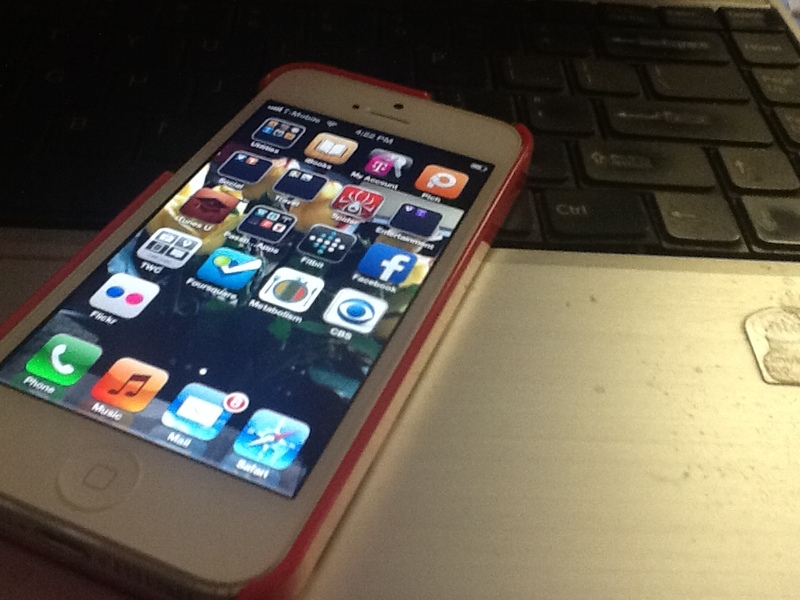 My iPhone 5 arrived last Friday and I love it. I’ve been busy setting it up and figuring out how to integrate it with my other electronics. And I am finally able to use apps and social networks that were either not available to me or were just clunky to use with my iPad. So that’s what I’ve been up to this week. As for the holiday weekend: While I do not want to lose sight of the fact that Memorial Day is a somber event honoring those who died for our country, I am looking forward to three days where my husband and daughter can both relax a little. Not to mention the new episodes of Arrested Development debuting on Netflix on Monday. I may even decide to watch them on my phone. The Galaxy is an awesome phone, and if T-mobile had said “we’re never making a deal with Apple,” I would have bought one. It’s just that I have been waiting SO LONG for iPhone, and HAD to hold out just a little bit longer. I was afraid after all that build-up that it would be a letdown, but so far it is not. As for PTCH, they say they will release an Android version in June.